In keeping with the Savior’s own experience, there has been a long history of rejection and a painfully high price paid by prophets and apostles, missionaries and members in every generation—all those who have tried to honor God’s call to lift the human family to “a more excellent way. Sometimes that “painfully high price” and “rejection” can hit very close to home. Recently, the missionaries informed me that one of the people we have been teaching the gospel to, who is ready to join the Church and be baptized, is facing a situation that falls into the category of a “painfully high price”. She is a young lady, 20 years old, who doesn’t live at home. However, she has a great respect and love for her parents. Throughout her life, her parents have told her they would support her with whatever she chooses regarding choosing a religion. However, when she approached them about joining the Church of Jesus Christ of Latter-day Saints (i.e. Mormon Church), her parents came unglued and told her they would disown her if she joined, based on some things they have read and heard about Mormons. She is shocked and heart-broken. On one hand, she has felt a peace, love and experienced God in a way that she can’t deny and her soul yearns for this relationship and she has a desire to strengthen that relationship and “formalize” it by making a covenant to serve God by being baptized. On the other hand, if she does this without her parents blessing, she fears her family will leave her. I can relate to her dilemma. When I was a very young man, a very close and dear family member made me promise them that I would never join the “Mormon Church”. At the time, that was the furthest thing from my mind. However, when I read the Book of Mormon and felt the overwhelming sense of peace that comes only from God, I knew that I wanted to join with the Church of Jesus Christ and that it was God telling me to do so. I had a clear vision given to me from God that if I stayed on the path I was on, it would lead to bad things later in life. On the flip side, my mind was opened up to the possibilities if I were to join the Church and follow Jesus Christ. When I shared my decision with my family member, they became very frustrated and when I heard them tell me they didn’t want to talk with me again, it hurt. We didn’t really talk for about 7 years and it was a very hard thing for me as this was and is a very close family member. Years later, after we had made amends and reconciled, my family member told me they hadn’t told me they wouldn’t talk to me, but that I had misunderstood them. Also, as an adult looking back, this family member had read and experienced some very negative things relating to the Church of Jesus Christ (i.e. Mormons), so they were trying to protect me from what they thought was harmful. Time heals wounds though, as they say, and over the course of years we were able to forgive each other. Looking back, I’m glad that I chose to follow what I felt was right and what God was telling me to do rather than make the easier decision to not join the Church in order to salvage the relationship in the immediate term at the time. We now have a good relationship and have made amends and it is by the love and grace of God that we were able to come back together and re-kindle our relationship. Having said all of this, based on personal experience, my suggestion for people such as our young friend is to follow what they feel God is telling them to do. If they feel that God is telling them to be baptized, do it. If they feel God is telling them to hold off on baptism for the time being, then do that. Don’t get baptized because it’s what your friends or missionaries want you to do and don’t hold off on baptism if you feel that is what God is telling you to do in order to save your relationship with your family member. Choosing to follow God will always lead to greater long-term happiness. It may hurt in the immediate term, but long-term you will always be glad you followed your heart and what you feel God is telling you to do. 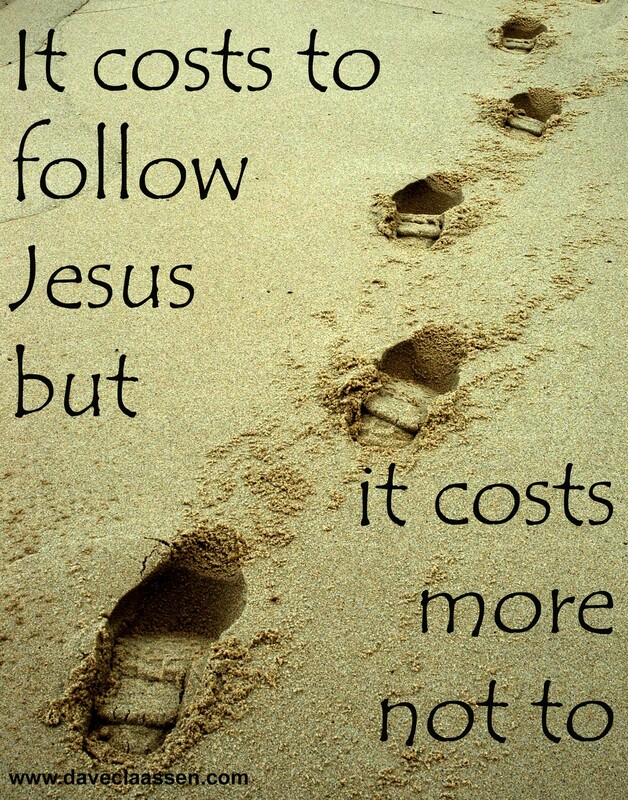 I really liked this poster that a pastor put together stating “it costs to follow Jesus, but it costs more not to…”This is all a part of faith and trust in the Lord as it says in the scriptures. Easier said than done, but when we choose to follow God, “all things work together for good to them who love God” (Romans 8:28). What advice would you give to this young lady or anyone else faced with this situation? For those interested about what the young lady’s decision was, after prayer, pondering and listening to peoples’ advice, she decided to be baptized. That really was a great talk! Sorry, I hit “post” before I answered your question. My husband’s parents were very unhappy when he joined the church. His dad was in the Catholic clergy, so it was quite difficult for them to accept. We had a rough few years, but now (25 years later) they are quite happy with how his life has turned out. His life is the most like what they envisioned for their children (except that he’s not Catholic). Time does heal all wounds. I would say that she should make sure that she has a support network if her family disowns her, because she will need it. Although she went through phases, her personal and recurring experiences with the scriptures and the Spirit ultimately helped her make the decision to be baptized. I think there’s a universal lesson there no matter our circumstances….like Howard W. Hunter said: “when you have worries and challenges, face them by turning to the scriptures and the prophets” (Fear Not, Little Flock, 1989). 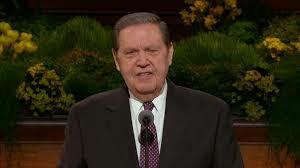 Answers will emerge if we turn to and rely on the words of the prophets. Personal guidance from heaven will come, sometimes delivered by inspired friends. Very good post. I’ve struggled with this as well. Although it was a painful situation I’ve learned that god can and WILL heal or mend a broken heart. Your advice is good. I followed my testimony into the waters of baptism some 35 years ago against my family’s wishes. Wasn’t physically disowned, but my parents were not happy or supportive. Served a mission, married in the temple, had five kids, and through the years, my parents have had to admit their fears were groundless and based on ignorance. Time will heal the wounds so much the better if the member tries his or her best to lead an exemplary life. My advice would be the same as stated above: Pray, fast if necessary, and find out what God wants you to do; then do that. People will sometimes confuse you but God never will. I love your quote: “People will sometimes confuse you, but God never will”. Love it! Thanks for the post. It inspired me.